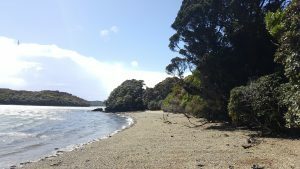 Since 1999, the Trust’s studies on Rakiura / Stewart Island and the outlying islands have shown a rapid decline in numbers. Traditionally Whenua Hou / Codfish Island was considered to be a stronghold with a stable population, partly because it is predator-free. However the number of 61 nests found in 2001 had dropped to 46 in 2009, with a further decline in 2017 to 14. This consistent reduction in the number of nests means fewer eggs laid and fewer chicks hatched. To try and isolate the possible reasons for this marked and continued decline, it is urgent to continue monitoring the population of hoiho on Rakiura and Whenua Hou. Further foraging studies of the hoiho in the marine environment, of which little is known, should be included in future research proposals. Population estimates for hoiho are based on the number of breeding pairs. Before 1999, the estimate for Rakiura was 470 to 600 breeding pairs but, based on extrapolation from partial surveys carried out in early years, this number was viewed with ‘a great deal of skepticism’(McKinlay 2001). To rectify this, the Yellow-eyed Penguin Trust, in collaboration with the Department of Conservation, carried out a more comprehensive census of hoiho numbers on Rakiura (1999 and 2000) and some of its outliers including Whenua Hou (2001). The results showed a much lower than expected number of breeding pairs on Rakiura (79) and very few juvenile birds compared to those observed on Whenua Hou. This led the Trust to believe that feral cats might be affecting breeding success on Rakiura. Between 2003 – 2008 a study of factors affecting breeding success on the north-east (Anglem) coast of Rakiura (where cats are present) was compared with two outlying island sites (Whenua Hou and the Bravo Group) where cats are absent. On the Anglem coast, no evidence of predation was found, but chicks were dying from starvation and disease, breeding success was consistently poor, and the number of breeding pairs had declined by 50%. In comparison, breeding success at the island sites fluctuated, while nest numbers remained relatively stable. During this five-year study, various other complementary studies were carried out. Between 2004 and 2006, the foraging behaviour of penguins was studied with GPS dive loggers. These devices, which determine the penguins’ geographical position after each dive and record dive depths and ambient temperatures at 1-second intervals, allow a detailed analysis of the birds’ foraging behaviour and effort. The main aim of the study was to examine whether the observed chick mortality was as a result of prey shortage within range of the breeding sites. Usually, prey shortages are compensated for by penguins travelling further and diving deeper. However, penguins from Rakiura were foraging close to shore and revisiting distinct areas to search for prey. This indicated that their foraging ranges were greatly limited, most likely due to the degradation of the sea floor ecosystem as a result of the commercial oyster extraction. In comparison, the penguins from Whenua Hou had wide foraging ranges, but this was nevertheless indicative that the prey situation closer to their nesting sites was poor. Because the number of breeding pairs in the last five years declined considerably on Whenua Hou, follow up foraging studies will allow us to assess whether the food situation for the penguins has further deteriorated. Following the five-year study, a census of Rakiura repeated in the 2008/2009 season found that the decline was localized to the Anglem coast, and that there was a shift in distribution of hoiho breeding sites. In 2009/2010, a repeat census on Whenua Hou found a decline to 46 compared to the 61 found in 2001, and in 2011 there was a further decline to 39 nests. The Neck: 6 nests were found, and the overall productivity was 1.0 chicks per nest. Bravo Island group: 14 nests were found, and the overall productivity was 0.71 chicks per nest. Whenua Hou: 39 nests were found, and the overall productivity was 0.89 chicks per nest. Despite the number of nests on Whenua Hou remaining the same as the previous year, the reproductive success rate had declined. The Rakiura Maori Land Trust is the Land Administrator of most of the Maori land on Rakiura, including at The Neck. The Trust is delighted to work with them in this area. The Neck: 5 nests were found, and the overall productivity was 1.2 chicks per nest. Bravo Island group: 20 nests were found, and the overall productivity was 0.6 chicks per nest. Whenua Hou: 37 nests were found, and the overall productivity was 0.78 chicks per nest. The Neck: 3 nests were found, and the overall productivity was 0.33 chicks per nest. Whenua Hou: 32 nests were found, and the overall productivity was 0.9 chicks per nest. This year double nests counts were undertaken on Whenua Hou to determine detection rates and provide a population estimate. Bravo Island group: 17 nests were found, and the overall productivity was 1.47 chicks per nest. This was the most successful season recorded on the Bravo Islands since 2004. Whenua Hou: 35 nests were found, and the overall productivity was 0.54 chicks per nest. This has been the poorest season on record, and while no evidence of disease was found, the condition of the chicks suggests this result is linked to food supply. Anglem coast: 14 nests were found, and the overall productivity was 1.08 chicks per nest. Whenua Hou: 24 nests were found, but the productivity was only 0.58 chicks per nest. The low number of hoiho nests found on Whenua Hou is of grave concern, meaning this decline in nest numbers has continued, and at the current rate there will be no hoiho nesting on Whenua Hou by 2030. Bravo Island group: 17 nests were found, and overall productivity was 0.88 chicks per nest. There was no evidence of disease in chicks at any site. Hoiho annual monitoring was repeated on the Anglem coast, the Bravo Islands group and on Codfish Island / Whenua Hou. 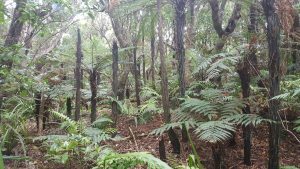 This continued decline on Whenua Hou in particular, is of grave concern, and the Trust is working with their partners DOC and Ngai Tahu to form a plan of action.